The Left Alliance also increased its support, garnering 8.2% of the votes, and increasing their seats from four to 16 in Parliament. Helsinki: The Centre-Left Social Democratic Party (SDP) has narrowly won Finland's general election, with 17.7% of the total votes. With 99.3% of the ballots counted as of early Monday morning, the SDP, headed by former union leader Antti Rinne, obtained 17.7% of the votes and 40 seats in Parliament, while the anti-immigration Finns Party -- who are also in the opposition -- obtained 17.5% of the votes and 39 seats, reports Efe news. Thus, in a result that may be a harbinger for Europe-wide elections later this year, the nationalist Finns Party managed to garner more votes than the conservative governing National Coalition Party (Kokoomus) headed by Acting Finance Minister Petteri Orpo, which secured 17% of the votes and 38 seats. The Center Party -- which is also in the country's governing coalition -- headed by outgoing Prime Minister Juha Sipila, appears to be the big loser in the vote, obtaining 13.8% of the votes and 31 seats in Parliament, its worst showing in history. In Parliament, resulting from the 2015 legislative vote, the Center Party had held 49 seats after garnering more than 21% of the vote. Meanwhile, the Green League is the party that gained the most support -- after the SDP -- capturing 11.5% of the votes and 20 parliamentary seats, five more than they obtained in 2015. The other parties obtaining seats in the new 200-seat Eduskunta - Finland's Parliament - are the Swedish People's Party with 4.5% of the votes and nine seats and the Christian Democrats with 3.9% of the votes and five seats. Blue Reform, a party that split off from the Finns Party, received 1% of the votes but did not manage to secure any seats in parliament. 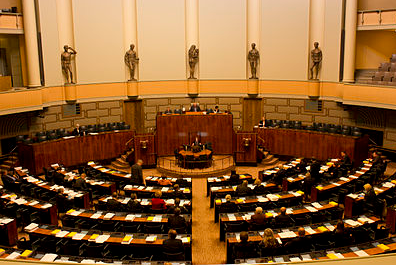 The leftist SDP has not held the post of prime minister since 2003. Among the party's key policies are favouring work-related immigration to ensure that the labour force in Finland -- whose population is aging -- does not stagnate and allowing in a moderate number of refugees from afflicted countries on humanitarian grounds. More than 1.5 million people -- 34.5% of the total -- voted in advance of the parliamentary elections on Sunday under a system put in place in 1970 to encourage participation.